• The pallets can be cut and joined together to create a stylish and large dining table which can be used in both indoor and outdoor location. 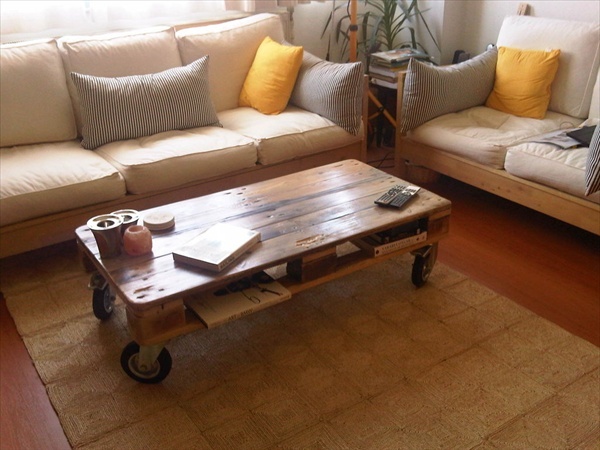 • A coffee table can be crafted by building a base with pallets and placing a stylish glass surface over it. • The lounge space can be filled up with TV and corner tables for decoration pieces. • The pallets can be designed into an office table with shelves and drawers for keeping necessary items. • Your child room can be decorated with a trendy study or computer table from painted pallets. You can also use pallets as patio, entry and kitchen table. DIY Pallet Wood Shelving Unit – Solid and Lasting! !